I have been training my dogs and helping other people with their dogs for over 17 years. Love 2 Play grew out of demands from my friends to pass on the knowledge I was gaining by attending workshops. The world of dog training has changed significantly in the past decade and I travel to numerous multi-day seminars each year in order to keep abreast of improvements in training methods in obedience, agility and behaviour. Initially it was for my own benefit training my dogs, but now I attend seminars in order to bring to my doggie classroom successful training methods based on science. In addition to receiving my certification through the Certification Council of Professional Dog Trainers (CPDT-KA) in 2010, I graduated from Karen Pryor Academy of Animal Training and Behaviour (KPA-CTP) and am a Certified Training Partner. I am also a Certified Behaviour Adjustment Instructor (CBATI), an Certified Dog Behavior Consultant (Associate) and recently certified as a Nosework Instructor with the National Association of Canine ScentWork (NACSW). My continuous education shows in the accomplishments of my own dogs. Before his retirement my smooth collie, Andrei, placed 4th in his class at the AAC BC/Yukon Regional Championships 2 years in a row and 4th in his class at the AAC National Championships, achieved his agility championship, his CARO (RallyO) Versatility MCL, his CKC Novice Rally title, his CKC CD and worked as a St. John Ambulance Therapy Dog. My border collie, Nai'a, marker trained from 8 weeks, has completed her CKC Rally Novice and CARO Novice, Advanced, Excellent, Novice Team, Advanced Team, and Excellent Team titles (with several scores of perfect 200). As well, she competes in agility, scent work and is certified as a St. John Ambulance Therapy Dog. We dabble in Canine Musical Freestyle and Scent Hurdle (so many dog sports, so little time!). My adolescent, Torrent (also a border collie) has a passion for scent detection and was the first dog in Canada to pass his Novice and Advanced Titles with United Nosework (now the nosework program with United Kennel Club). My youngster, Focus, has taught me about the power of impulse (self) control and is turning into an amazing working dog. 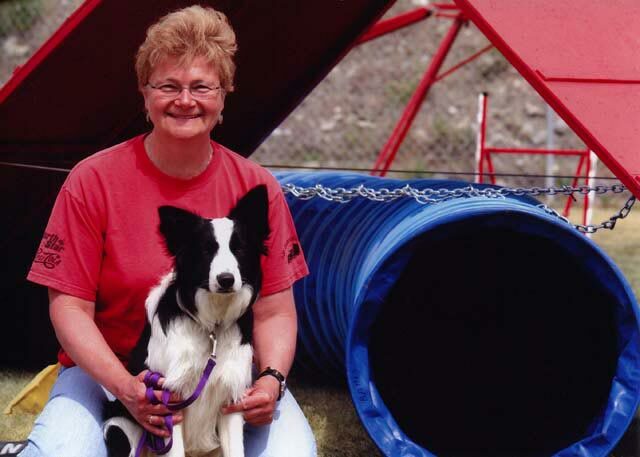 I am a judge with the Canadian Association of Rally Obedience (and have been a member of the national executive for 7 years), a rally and agility judge with the Canadian Kennel Club, an agility judge with the Agility Association of Canada and a nosework judge with Canine Work and Games. I am a member of the Canadian Association of Professional Pet Dog Trainers and the Association of Professional Dog Trainers. I have been passionate about scent detection for several years and in 2015 I became a Certified NoseWork Instructor. I am a Certified Behaviour Adjustment Trainer and in early 2016 I completed my certification with the International Association of Animal Behavior Consultants. In late 2017, always dedicated to professional development, I became a Certified Trick Dog Instructor. And am presently working towards my certification as an AKC Scentwork Judge and an AKC Trick Dog Judge. My passion is teaching people and watching their dogs learn. In my ‘other’ life, I was a teacher of the deaf and hard of hearing and also taught at UBC in the masters program educating potential teachers of the deaf and hard of hearing. My dog students benefit because my teacher training background has made me adept at breaking down concepts and individualizing instruction. Online Seminar with Pamela Dennison "Living in a Multi-Dog Household"